Lofts & Hospitality is a 1200 sq. 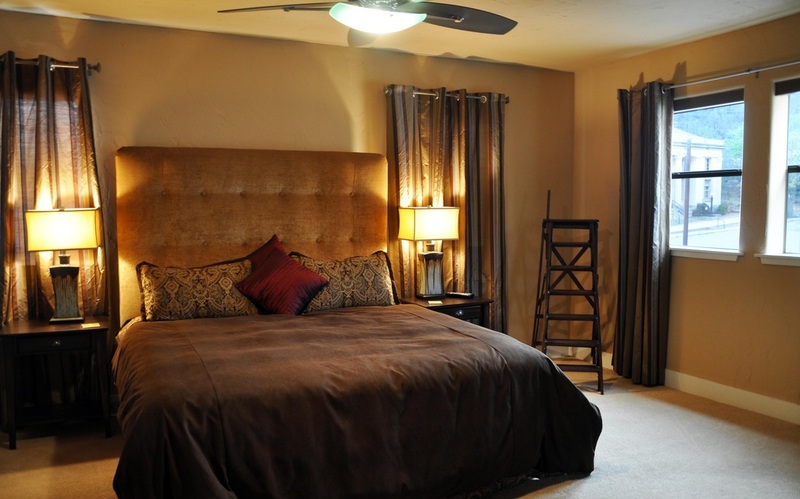 ft. space that features an upstairs master suite complete with king size luxury custom bed, flat-screen television. Downstairs features an open living space with a commercial kitchen including a Wolf range with infrared grill, Sub-zero refrigerator and freezer, Ice maker, Microwave, Large Capacity Sink, and Dishwasher. The prep area is also a granite bar (seats 3) suited perfectly for buffet style serving. There is a breakfast table that seats four. The living area features a fireplace with cabinet top suitable for serving, a sofa and love seat in front of a large 60″ flat-screen television. There is also a small room that holds a double bed, private vanity and shower. A small half bath, laundry area and cedar office are located in the rear of the building. The loft also has an unique front room which includes a pool table, poker table and other game options. It has gated private covered parking/patio area. The loft is accessible through keypad entry set for your unique and preferred code. Free Wi-fi with password available. Have question about booking? Come to the Market Bistro & Market and we can help you reserve your next stay.